Alright, I have a fantabulous (I know that’s not a word, but I had to come up with a good word, because this is so awesome!) Mom invention for all you Mom’s who are always on the go, go, go! I am always leaving the house to go some place, and I catch myself stuffing, toys, books, and necklaces (my daughter loves necklaces!) in my diaper bag making it over filled. I had to come up with a way to stop my excessive toy stuffing….so I searched the web, and found the Toy Nanny, by 2 Red Hens. This solved so many of my problems I was facing. I now have a separate adorable cute bag for my daughters toys. But, this is not just for toys. Or at least for me it’s not. I am almost tempted to use this as a diaper bag! 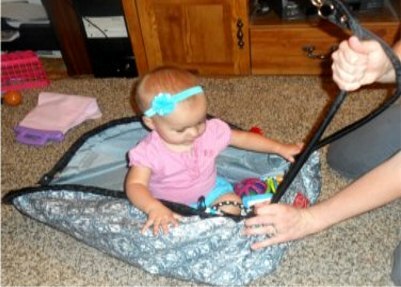 It seems so handy and perfect for a diaper bag situation. I took this to the pool one day, and I filled it to the top. I put in, 3 beach towels, an outfit for me, my hubby, and daughter, wallet, a few toys, wipes, diapers, swim diapers, snacks, and drinks. I didn’t get the bag fully closed, but nothing fell out. I wished I would have snapped a picture of it! This is for sure going to be my pool bag from now on! The bag is also great for traveling. Especially weekend trips to Grandma’s! This beautiful bag turns into a lovely play mat for your babies. I’m sure all kids dream of being on the same bag as their toys. My daughter felt very special, and would not get off the center spot where they sit. She just loved it! The bag is 36 inches in diameter. It is suitable for even toddler aged children. The bag is also PVC and BPA free. so no worries of harming your baby! Turning the bag into a mat takes about 30 seconds, it’s super easy and fast. Turning the mat into a bag takes about 30 seconds as well. It was a little hard to pull the straps at first to turn it into a bag. I thought I was going to break it if I pulled too hard. But that is not the case. YOU will not break it, even if you are Super Man! (Okay I am sure Super Man could break it, but I had to add a little humor into my post.) The chances of the straps breaking are slim. So use those muscles, and pull….it gets easier as time goes on as well! The Toy Nanny has a thick water resistant outer covering. (The design part) I don’t know how many times I put a blanket on the grass at the park and it gets soaking wet from the grass. This water resistant thing was a good plan! On a side note, the Toy Nanny is machine washable. Making life easy for those bags, that always seem to get dirty, no matter what you do. This comes in 4 different other colors, you can see them here. They are all adorably cute! The bag has 8…yes 8, Velcro pockets on the sides. This makes it easy access for the important things. For instance, if you were going to the park, and didn’t want to take your diaper bag, so you pile the toys in your Toy Nanny, and you can use the pockets to put your wallet and keys. It’s perfect. The one thing I didn’t like so much was the metal clips. These clips are there to make sure that the play mat is completely flat. You undo the clips when it’s in the form of the play mat. When it’s the tote bag, you clip them to hold the straps together. The only thing is that the metal clips end up resting on your shoulder, so it does dig a little into your shoulder, if you have tons of toys in there. Now that you know about the features of the Toy Nanny, I’m going to share with you my favorites! 1. The 8 Velcro pockets for pretty much ANYTHING! 2. The super cute, chic, styling, bag designs they have. 3. The fact that it turns from a tote into a play mat. That is just totally awesome! 4. Machine washable. You for sure know a Mom invented this. She knows that kids LOVE to get messy, and everything around it. Those are my favorite features of the Toy Nanny. As I said before, if you are a Mom on the go, this is a must have! If I didn’t have it, I would for sure make sure I had one, as it is on my my essentials now! Here is a video of some features of the Toy Nanny. You can follow 2 Red Hens on Facebook and visit their site with many other baby items here! 2 Red Hens is offering to GIVEAWAY a Toy Nanny! Open to USA, No Purchase necessary. Contest ends on July 26, 2013 at 11:59 pm EST. This promotion is in no way sponsored, endorsed or administered by, or associated with, Facebook. The winner(s) will be selected by random.org and notified by email and will have 24 hours to respond back to original email with their shipping info or a new winner is selected. Good Luck! « Make your Refreshing Mouthwatering Smoothies with Ninja Kitchen System and Blender! My favorite design is the blue and back zig zag stripes. This product looks amazing. I like the mesh pockets on the side. I could fit stuff for both of my kids in it easily! I have a lot of meetings I go to with my kids and this would be awesome to take all of their toys really easily. And have a clean place for my baby to lay. I love the owl design! I love the blue ones!!! I like the Owl design. That the toys can stay all in one place as we travel. I like that it has pockets. I like the owl dots design. I like the velcro pockets for small toys like McDonalds toys. I blue Chevron Stripes is my fave style. I love the Owl Dots! I love that it’s machine washable! Love this! Such a cute concept!!! I love that it is so cute and stylish! I also think that all of the patterns are adorable! THIS IS REALLY A COOL ITEM!! I love the chevron stripes. I really like the easy accessibility and large capacity of the bag. This is really awesome, I love it. I like that its water resistant. I love that it turns from a tote into a play mat. I love this! My 7 year old daughter would go crazy for one to carry all her trinkets and toys. I like the large capacity of the bag. I love the red bag. i love the owl design…and i like that it has pockets. I like the blue chevron. Would use for my boys many many many many many Lego. Did I mention they have a few? I love that it is machine washable and I like the Peacock Mum print! I like how easy it is to use and the whole concept of it! I like the Peacock Mum style the best. I think the gray and white one is so cute, this is such an awesome Idea. 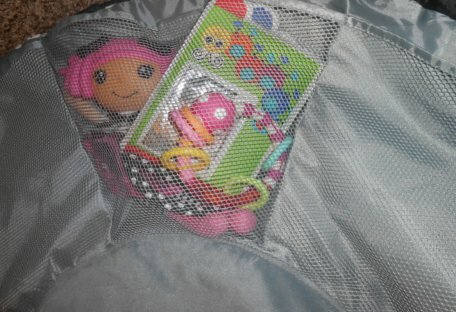 I always find myself putting toys and baby stuff in my purse! I like the mesh pockets and love the peacock mum print. I love the mesh pocket! the Velcro pockets are great! And the peacock mom print is gorgeous. I like the velcro pockets, and I like the pink lemonade print. I like the blue chevron zig zag bag. I love how this makes it easy to take toys to the park or to visit someone. It also gives a clean place for the kids to play. My favorite design is the gray. I love that it’s machine washable. Great idea! Favorite design part is the machine washable part! Everything needs to be machine washable! And the red is adorable! I like the peacock mum! I like that you can use it for a tote after you clean up all the toys. I love the easy clean-up. My favorite design is the chevron bag. This is one of the coolest items I’ve seen pertaining to a carry all for kids stuff. I like the fact that when it’s opened they can play on top of it and that it’s water resistant so if the ground is a little wet they won’t get wet. The 8 pockets help to organize so many things that might normally get crammed into a diaper bag. The ease of folding it into a tote and then it opens up into a play mat makes the number of bags that have to be carried when taking children out anywhere is a big plus. And best of all it’s machine washable. I would give it to my nephew so I like the dark blue with zigzags. I love that it has eight mesh pockets and owl dots is my fav design. I like the blue and black zig zag stripes. I like either the Peacock Mum or Pink Lemonade design! I love the mesh pockets so you can see what’s in it. Also, I really like the blue chevron stripes! I like the pockets. The grey Damask is my favorite design. Oh I also love the Thick water resistant covering! I like the one that is red inside, what’s not to love about this? 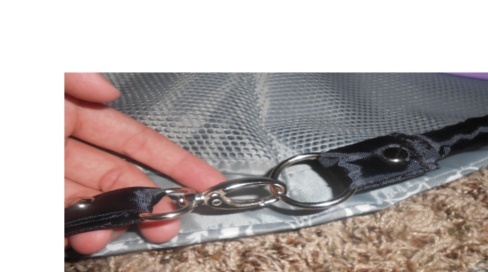 The fact that it’s like a purse is super cool & that it has mesh pockets inside to keep things secure too! 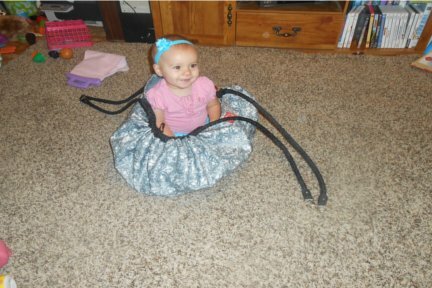 Some of my favorite features about the Toy Nanny are that it is a tote that turns into a play mat, it is PVC and BPA free, machine washable, has a thick water resistant outer covering, and eight Velcro pockets on the sides for diapers, clothes, snacks, toys. My favorite design is the Owl Dots. I love all of them but the Chevron Stripes are really cute. I also love that it folds up so nicely in to such a cute bag. I love that is also has mesh pockets and I love the peacock mum pattern! I love the overall design and the stylish patterns! Love that it is machine washable and love all the Velcro pockets!! My favorite feature is that is turns into a mat. I love the chevron stripes design. I love the fact that it has so many pockets because little kids like LITTLE things! Nice way to keep them from scattering everywhere when you open it up. What a cute idea! Love the zig zag one! There is so much to love about the Toy Nanny. I love the 8 mesh pockets and I love the fact that you will always have a clean place for your baby to play! The Pink Lemonade would be my choice. Love the mesh pockets to hold the toys. And I like either blue one. My favorite is the blue zig-zag. I like the convenience of the bag. It’s versatile, I like the idea of a central play area that provides super easy clean up!! I love the ability to quickly clean up toys! The easy scrunch up and go feature. I love the black and red one. I love that it has a handle so its easy to Cary. I love everything about it! All the designs are cute! I love the owl design! The mesh pockets are amazing! 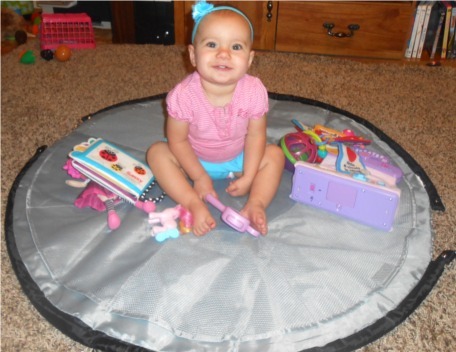 It’s portable, easy to clean and keeps all of babies toys in one sanitary location. This is such an awesome idea. Thanks for the giveaway. I love the pockets! This looks absolutely amazing! Lots of pockets! I like the red design. I love the blue one and the mesh pockets are a wonderful idea!! I LIKE Peacock Mum, and I like everything abut this item. Would make an awesome gift. This is so cute. I’d use it with my first grandchild due in October! The owl design is my favorite. What a great idea. I love the blue zigzag design. my favorite features would be the waterproof outside and the velcro pockets! I am always digging for things that fell out of the inside pockets of my toddler’s diaper bag. This would be so useful! I love the blue zig zag striped one. I love how they have the pockets. I like the lighter blue one.. SO CUTE! I think this bag is smart! My favorite part would have to be the versatility of the whole thing! I love that its waterproof and that it can hold so much!! I can definitely use this for my little guy!! I love the pink one…..or maybe the teal, I’m not picky!!! Lol!! This would be perfect for the one-two weekends a month that we visit my mom who is 3 hrs away!! I love the feature that it is machine washable bc we all know that dirt happens!! I love the way it folds so conveniently, too!! With twin girls, I think this would hold a great deal and it would be so awesome to win!! Omg I LOVE the owl. This is great for parents on the go! Water resistance and I love all the colors!!. The owl or the blue design are cute. This would be handy for play dates! I like the Pink Lemonade design. So cute! I love the fact that it turns into a play mat, and is so portable! the multi functionality with the pockets and the water resistant outer covering. I like the blue zig zag design. I love the idea of a nice clean place for the little one to sit and play. I also like the convenience of it. I am tossed up between the grey one and the owls. I love how quick it makes clean-up. It also looks super cute!! I just love the Peacock Mum design! That’s definitely something I’d carry around all of the time!! I like the like blue with the round circles on it. I would use it when I go to the beach with the grandkids or even just to the pool in the back yard. I would love this for my granddaughter….I love the mesh pockets. I love the owl design. I like the gray design i will give to my grand daughter. I love all the designs!! I love the pockets!! My children love to bring tiny annoying toys that they lose all the time! I love the entire idea behind this!! Genius!! I can’t pick a favorite design because they are all so classy and chic!! Well done!! This was my 1st time seeing this! Awesome idea!! I love the pink one. I would give it to my cousin for he little one on the way! Its a great size, plenty of room. I love how you can zip up all the toys! i would love to try this with our outside playgroup. would be very easy clean up. I like that you can just toss everything in or if everything is already on the mat you can just gather it up and go. I like the black an blue zig zag pattern best. I like that it is stylish and also that it as so many nice pockets! I like how it can hold a lot of stuff and take up so little space. When you have your hands full with kids; its hard to carry all the stuff you need. I love how simple it is to use, my kids almost 4 and 5 can clean up the toys themselves! There are many styles that would work for us. This is such a great idea! Owl looks cute. the blue one and i like it bc it has pockeds to put the troys. I really like the easy to transform from tote to playmat! My favorite design is the grey damask. I really like the grey damask design. My favorite thing about the toy nanny is the portability of it. So nice that you can quickly and easily gather up the toys and be off to your next adventure! changes from tote to mat. I love that it has a bunch of pockets for holding toys. I love the pockets to put toys in! What a great bag/play mat!! I love that it looks stylish in the bag form and can be scrunched down to be more compact or left open a bit to fit a bunch of stuff like you mentioned in your video. I love the fact that it can carry anything. I love the white and pink one! Neat Thing to have around!!! esp when traveling!! Love the blue and black one!!! I like that I can out things for all 4 of my children in there. I like how it can be used as a play mat and keeps toys all neat & tidy. I like the peacock mum. I like the blue and could think of soo many great uses! I like how easy and fast it is to turn it from a bag to a mat. And I LOVE the owl one!! even tho it is for the kids. its in beautiful adult patterns as well, and looks so cute and stylish folded into a bag. I love it! I like the blue chevron stripes…. I like that it holds a lot of toys. This would also make a quick nap-pad or emergency changing pad. I love the little pockets to keep things in—I also love that it’s a toybag and a mat all in one—many times I’m looking for a clean place for the little ones in our family to play–this is perfect! My fav design is the zig zags! THINK THE OWL ONE IS CUTE!!!! I like that there are plenty of Velcro pockets and the fact that it turns from a tote into a play mat. I like the black & gray design. The Owl Dot fabric is so cute ! The best thing is that you can toss it in the washer when it gets dirty. I LOVE the silver one. The whole idea is brilliant! I love the pink one..but they are all very nice! This is a great idea to have one of these to carry everywhere you go! I love the pockets! I could actually see using this for one of my larger crochet projects! one of the best inventions yet, I love everything about it! I LOVE the 8 pockets and the amount that you can store in this!!!! I love the blue zig zag and pink lemonade…..heck I like all of them!!! What a great idea!!! This would be perfect for blocks and legos and cars. 3 boys LOTS of little fun stuff everywhere. What a great way to keep it in a mess that is quick and easy to clean up! I want it for LEGOS. Even though my kids area bit older, it would be awesome to have them use that for LEGOS. I love that it wraps everything up perfectly! I love all the pockets lots of room to fit the little things into! And i love the idea of a portable play area that i know will be a clean, safe area to play on. I like the gray colored one. Plan on giving it to my niece if I win it! I love that it’s water resistant and has interior pockets! So neat! This would SO help with my kids! I love that it is waterproof and all the cute designs. I love that it is portable and a great place to keep all of my granddaughter’s toys when she isn’t here. I LOVE the pink one! I love everything about it! I’m not a mom, but I’m around kids all the time…work with them, babysit, nanny….I would love to have this to keep all my emergency kid supplies in! I love the Owl dots! I like the mesh pockets! I also like that it has 8 pockets. Loving the owl print.